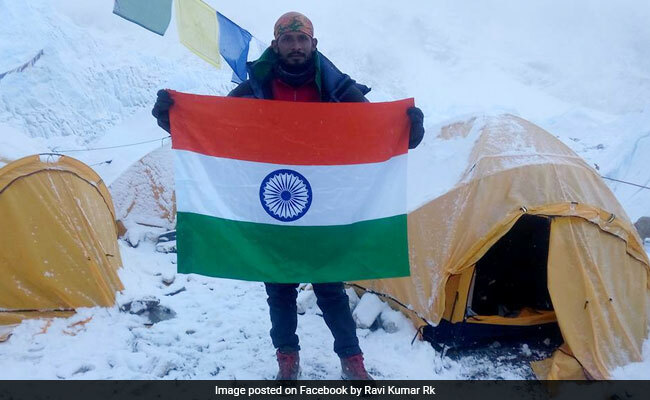 Indian climber Ravi Kumar, 27, reached the summit on Saturday but lost contact shortly after. His Nepali guide managed to reach Camp 4, just below 8,000 metres, but sustained severe frostbite. Ravi Kumar's body was spotted about 200 metres (650 feet) from the main route. Rescuers on Everest found the body of a missing Indian climber on Monday. He was the fourth person to die on what's called the "death zone" of the world's highest mountain over the week-end. This was the deadliest episode since an avalanche swept through base camp two years ago, killing 18 people. All the fatalities appear to be related to altitude sickness. Ravi Kumar, 27, had reached the summit on Saturday, but lost contact with the base soon after. His Nepali guide managed to reach Camp 4, just below 8,000 metres, but sustained severe frostbite. "A search and rescue team has seen his body," Thupden Sherpa of Arun Treks and Expeditions told AFP. Mr Sherpa said Mr Kumar's body was spotted about 200 metres (650 feet) from the main route and the team was assessing the feasibility of retrieving it. On Sunday, an American doctor, Roland Yearwood, and Slovak climber Vladimir Strba died above the 8,000 metre mark -- an area known as the mountain's "death zone", where the thin air heightens the risk of altitude sickness. On the Tibet side of the mountain, an Australian climber died, the local media reported quoting the Tibet Mountaineering Association. The 54-year-old from Queensland was reportedly hit by altitude sickness after reaching 7,500 metres and died as he was trying to descend. His name has not yet been officially released. In late April, legendary Swiss climber Ueli Steck died while on an acclimatization climb, and 85-year-old Min Bahadur Sherchan died in May while attempting to reclaim his title as the world's oldest person to summit Everest. Over the last three days, more than a dozen climbers were rescued from the 8,848 metre (29,030-feet) mountain after they ran into difficulties, helicopter rescue operators told AFP. The season has been marked by strong winds and unusually cold temperatures. The weather had calmed over the weekend, opening a narrow window for climbers to make a bid for the top. Over a hundred climbers are expected to attempt to summit from Nepal's south side on Monday before the weather changes. There are forecasts of strong winds over the next few days. "Today, there might be as many as 150 climbers reaching the top from the Nepal side, but it isn't a record number," Ang Tsering Sherpa, head of the Nepal Mountaineering Association, told AFP. In 2012, 255 climbers reached the summit from both sides of the mountain on a single day, Mr Sherpa said. More than 120 climbers have successfully summited Everest from the south side so far this season, with another 80 reaching the peak from the Tibet side. Hundreds are still waiting to summit before the monsoon arrives in early June, marking the end of the short spring climbing season. Last year, the Everest claimed the lives of five climbers, while a total of 640 people summited from both sides of the mountain.